The Trench 2 extension continues to produce some interesting artefacts. Read on for more infromation. We continue to retrieve some important artefacts from the Trench 2 extension. Most of these have been found in a distinct area immediately above the former entrance into the cave and may have been placed in this location as votive deposits. 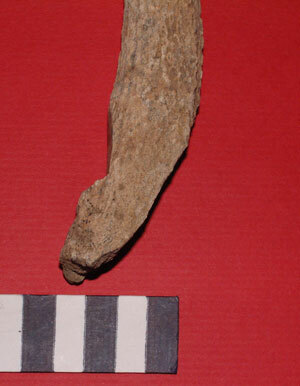 The discovery of a unique cache of pebble tools has already been discussed in the news page, but we have also recovered organic artefacts made from antler and bone. A second bone point was recovered in this area of the excavation, although not so well finished as that found last week (see previous entry in ‘Latest Finds’ section. This is a more expedient type of tool manufactured from a splinter of animal bone, retaining the unworked end as a form of handle. 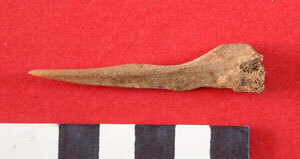 However, the most intriguing artefact found during the past week on site is the red deer antler tine shown below. The artefact was covered in soft sediments when first recovered, but after cleaning revealed some interesting features. 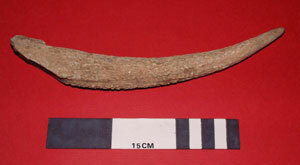 The tine had been removed from the antler beam using an oblique cut. A wedge of material had also been removed from the tine on the opposite side to the oblique cut, through which a hole had then been bored through. What is this item? 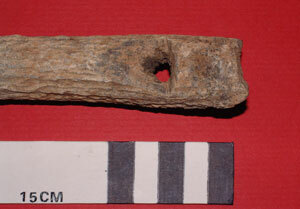 Could it be some form of Iron Age ‘tent peg’? Please add any comments on the potential function of this item at the end of this entry.